The man accused of plowing into people on a lower Manhattan bike path Tuesday allegedly was inspired by ISIS videos he watched on his cellphone, according to the criminal complaint against him. "He did this in the name of ISIS, and along with the other items recovered at the scene was some notes that further indicate that," John Miller, deputy commissioner of intelligence and counterterrorism of the NYPD, said this morning of the attack that killed eight. "He appears to have followed almost exactly to a 'T' the instructions that ISIS has put out in its social media channels before with instructions to their followers on how to carry out such an attack." The suspect was charged Wednesday with providing support to ISIS and violence and destruction of motor vehicles. 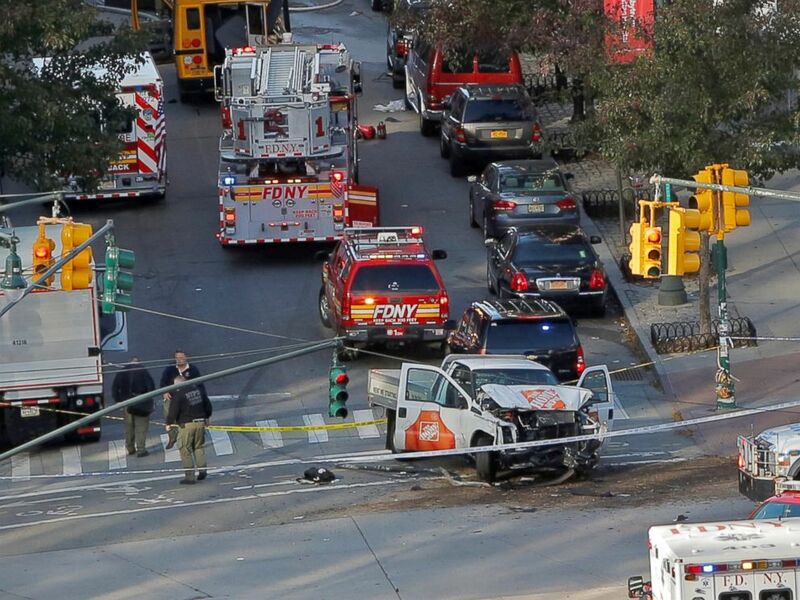 Authorities stand near a damaged Home Depot truck after a motorist drove onto a bike path near the World Trade Center memorial, striking and killing several people, Oct. 31, 2017, in New York. -- The suspect, identified as 29-year-old Sayfullo Saipov, was shot in the abdomen by a police officer and was transported to a hospital for treatment. He has been charged in connection to the attack and is eligible for the death penalty. -- Authorities are calling the incident a terror attack. Saipov is believed to have worked alone, law enforcement sources said. -- A handwritten note in Arabic was recovered from the scene. According to the criminal complaint against Saipov, it said, "No god but god and Mohamed is his prophet" and "Islamic supplication. It will endure." -- According to the criminal complaint, Saipov allegedly began planning an attack against the U.S. a year ago. He was allegedly inspired by ISIS videos he'd watched on his cellphone. Authorities said today that the suspect allegedly rented the truck from a Home Depot in Passaic, New Jersey, around 2 p.m. Tuesday. According to license plate readers on the George Washington Bridge, he exited the bridge at 2:43 p.m. and drove southbound on the West Side Highway. 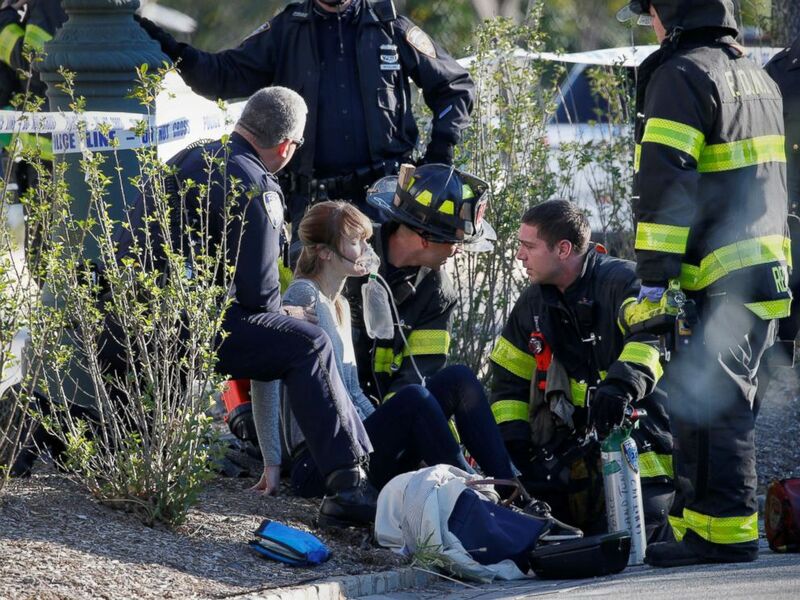 According to police, shortly after 3 p.m., the suspect started mowing down cyclists and pedestrians on a bike path near West Houston Street and the West Side Highway. The suspect drove south for about a mile, leaving strewn bodies and disfigured bicycles in his wake. Witness Eugene Duffy described one victim's body as "mangled," saying he was "traumatized" from what he saw. "Everybody was running," Duffy told ABC New York station WABC-TV. "Everything was happening so fast." 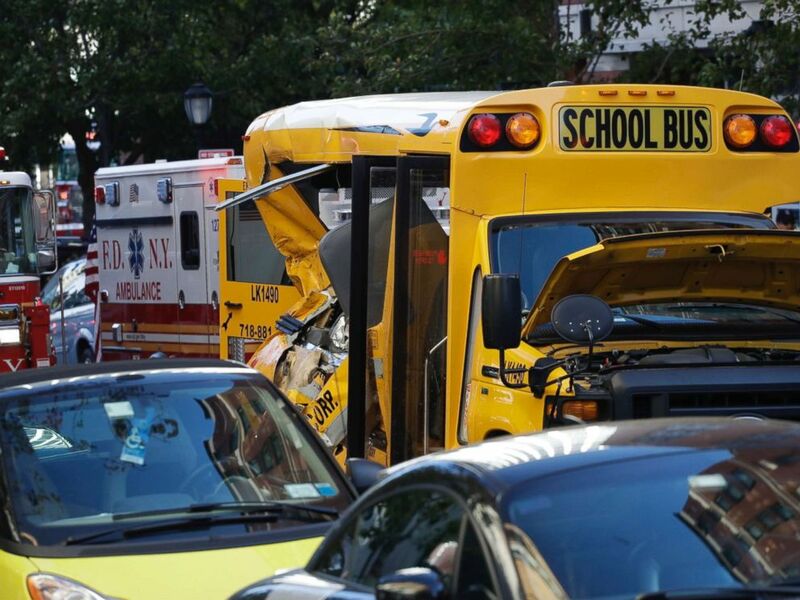 The suspect crashed into a school bus near Chambers Street, just across from Stuyvesant High School. A damaged school bus at the scene where a truck drove into a bike path, Oct. 31, 2017, in New York City. After colliding with the bus, he emerged from the car with a paintball gun and a pellet gun, allegedly shouting "Allahu Akbar," before being shot in the abdomen by NYPD police officer Ryan Nash. The suspect was taken to a hospital and is expected to survive. According to authorities, six victims were pronounced dead at the scene and two more died in the hospital. Twelve were injured, including two students and two staff members on the school bus. A woman is aided by first responders after sustaining injury on a bike path in lower Manhattan in New York, NY, Oct. 31, 2017. Two Americans were among the deceased; they were identified by police as Darren Drake, 32, of New Milford, New Jersey, and Nicholas Cleves, 23, of New York City. Drake's family told ABC station WABC-TV in New York that he had weight loss surgery three years ago and rode Citi Bikes to stay in shape. Darren Drake would have turned 33 on Nov. 18, according to his father. Darren was his only child. According to WABC-TV, Cleves, from Boston, was an only child living with his mother in New York. He rode his bike all the time, WABC-TV said. Five of the people killed have been identified as natives of Argentina. According to the country's consulate, they were visiting New York City to celebrate the 30th anniversary of their high school graduation. The five Argentines killed were identified as Hernan Diego Mendoza, Diego Enrique Angelini, Alejandro Damian Pagnucco, Ariel Erlij and Hernan Ferruchi, the consulate said. Argentina’s president, Mauricio Macri, said the victims were from the city of Rosario. "They were five young entrepreneurs, model citizens in Rosario society and I can only imagine with beautiful families,” Macri said in Spanish. Ann-Laure Decadt, 31, of Belgium, was also killed, leaving behind a 3-year-old son and a 3-month-old son, the mayor of the Belgian town of Staden told ABC News. Decadt’s husband, Alexander Naessens, called her death unbearable in a statement. She was on a trip with her mother and two sisters at the time of the attack, Naessens said. New York City Mayor Bill de Blasio said of the victims, "Six of them came from other nations here, because they saw New York as a special place to be. And we now, and forever, will consider them New Yorkers." The mayor's spokesman, Eric Phillips, said de Blasio was slated to visit with students and teachers at Stuyvesant High School on Thursday. Emergency crews attend the scene of an alleged shooting incident on West Street in Manhattan, New York, Oct. 31 2017. Saipov was born in Uzbekistan and moved to the United States in 2010. In 2015, Saipov was was interviewed by federal agents because he was listed as a point of contact for two men whose names were entered into the Counterterrorism and Criminal Exploitation Unit’s list after they came to the U.S. from “threat countries,” overstayed their tourist visas and vanished, a federal official told ABC News. Saipov was never the main focus of these investigations and he was never the subject of his own case file. 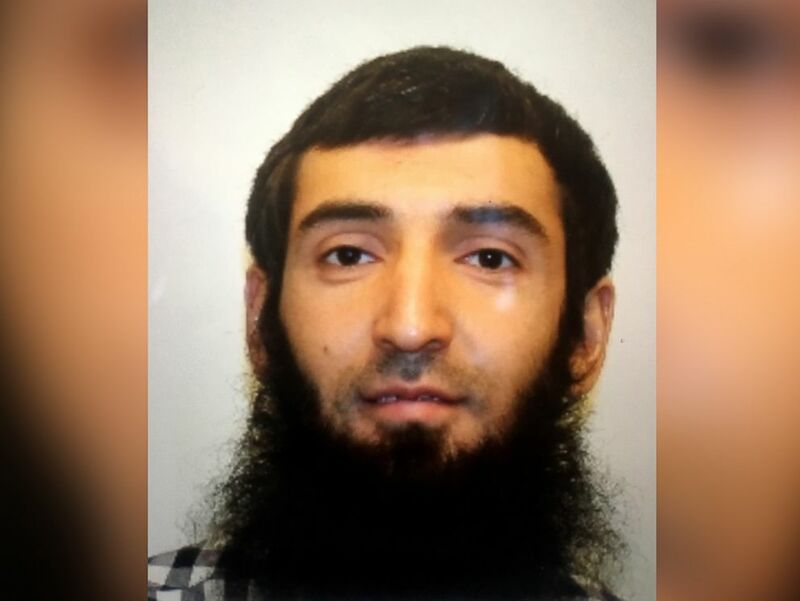 Suspect Sayfullo Saipov seen in this undated photo. Saipov entered the U.S. through New York's JFK Airport in 2010, according to law enforcement sources. He had a green card that allowed him permanent legal residence in the country, sources said. The green card came via a government program called the Diversity Visa Lottery, which hands out about 55,000 visas per year. After entering the country, Saipov first lived in Ohio before moving to Tampa, Florida. He then moved to Paterson, New Jersey, where he has lived with his wife and three children for several years, according to law enforcement sources. He rented the vehicle used in the attack at a nearby Home Depot. Saipov held business licenses for two Ohio-based trucking companies. He also worked as an Uber driver; the company confirmed that Saipov was a driver who passed a background check and recorded over 1,400 trips in six months. The company is assisting law enforcement with the investigation. Saipov drove for Lyft as well and that company is assisting law enforcement, too. At a news conference this morning, New York Gov. Andrew Cuomo called the suspect "a depraved coward." 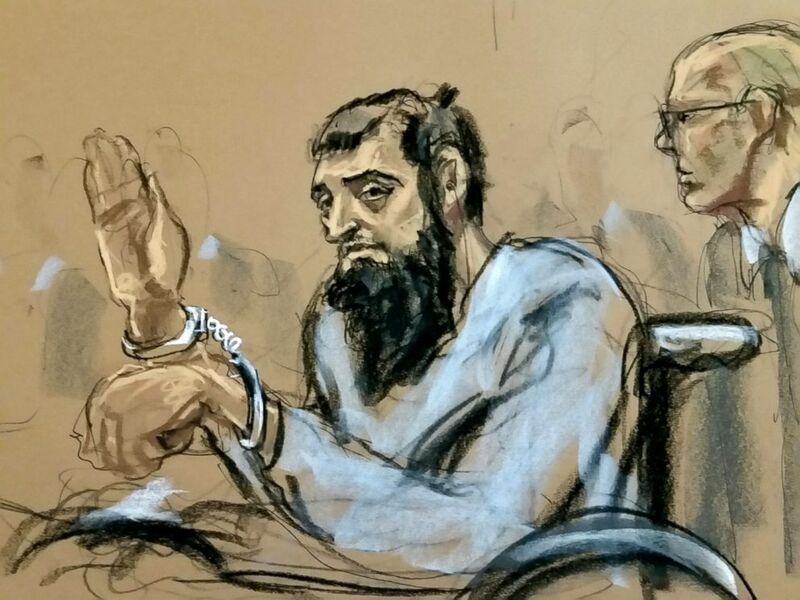 New York City terror suspect, Sayfullo Saipov, appears in federal court, Nov. 1, 2017, in New York City. Saipov allegedly said he was inspired to carry out his attack by ISIS videos he'd watched on his cellphone, according to the criminal complaint against him. He allegedly began planning an attack in the U.S. about a year ago, the complaint states. He allegedly chose to use a truck "to inflict maximum damage against civilians," according to the complaint. "Saipov wanted to kill as many people as he could," the complaint states. He "wanted to display ISIS flags in the front and back of the truck during the attack, but decided against it because he did not want to draw attention to himself." 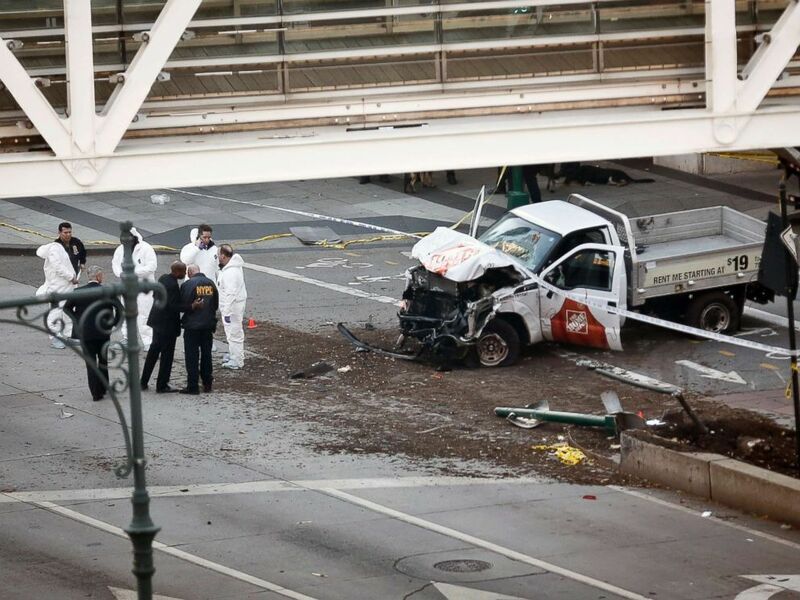 Had Saipov not run into the bus, he allegedly planned to use the truck to mow down pedestrians on the West Side Highway and then proceed to the Brooklyn Bridge, where he allegedly planned to strike more pedestrians. According to the complaint, Saipov allegedly told investigators he "felt good about what he had done." The complaint states that Saipov allegedly had 90 videos of ISIS-related propaganda on a cellphone, including one with instructions on how to make an improvised explosive device. The internet search history on a second cellphone showed searches for "Halloween in NYC" and "truck rentals," among other things. Saipov also allegedly rented a truck prior to Tuesday's attack to "practice making turns" with the vehicle, according to the complaint. Saipov allegedly chose Oct. 31 -- Halloween -- to carry out the attack because "he believed there would be more civilians on the street for the holiday," the complaint states. Saipov was wheeled into court for his initial presentment before a judge on Wednesday evening. A plea was not entered. 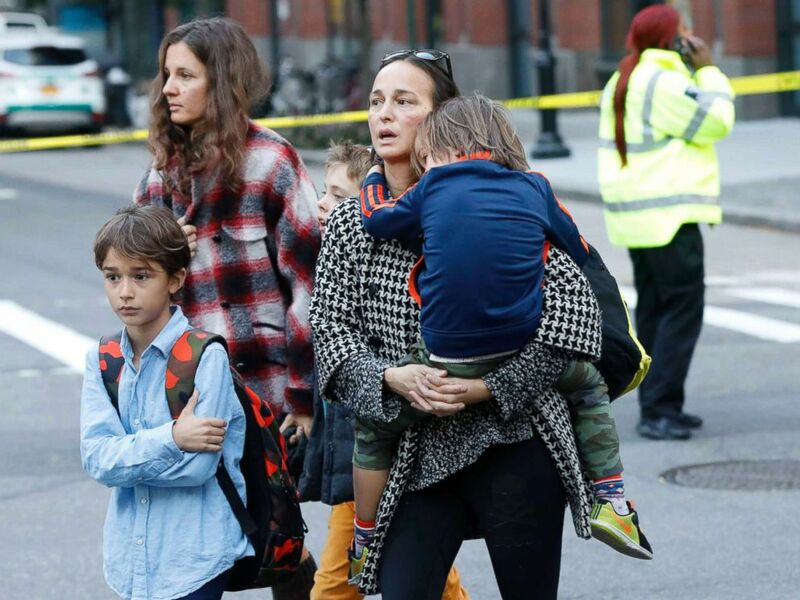 Parents pick up their children from P.S./I.S.-89 school after a shooting incident in New York City, Oct. 31, 2017. 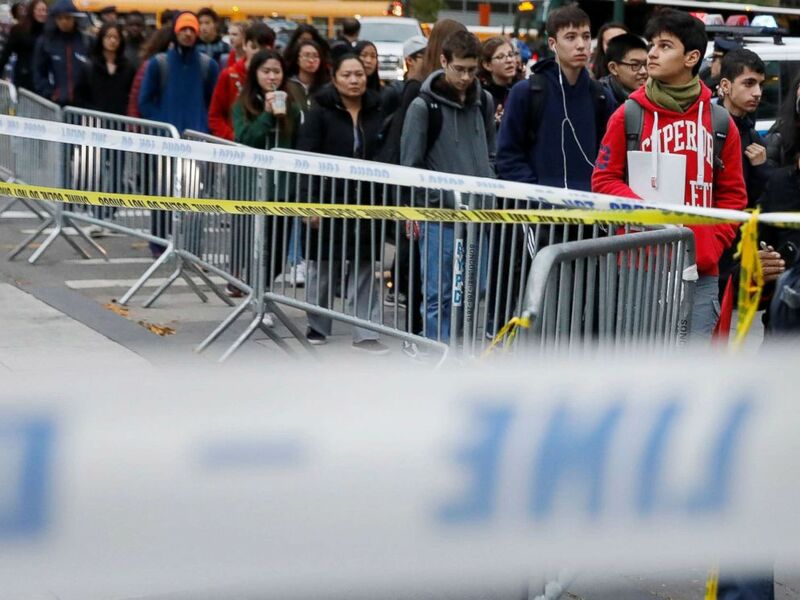 The victims "were enjoying the beautiful West Side of Manhattan on a beautiful fall day -- and they're not going to be returning home," Cuomo said Tuesday night. "That shock and that pain is going to be very real and our thoughts and our prayers are with all of them." Cuomo continued, "We've lived with this before. We felt the pain before. We feel the pain today. But we go forward together and we go forward stronger than ever." Students walk past police line tape on their way to school a day after a man driving a rented pickup truck mowed down pedestrians and cyclists on a bike path alongside the Hudson River in New York City, Nov. 1, 2017. He stressed that there is no ongoing threat, however, there will be increased security forces out of an "abundance of caution." "We're not going to let them win. And if we change our lives, we contort ourselves to them, then they win and we lose. We'll go about our business," Cuomo said. "To New Yorkers, be New Yorkers. And live your life. And don't let them change us or deter us in any manner, shape, or form."